Komeediklubi, Estonia’s most laughable club has been putting on stand-up shows since 2010. 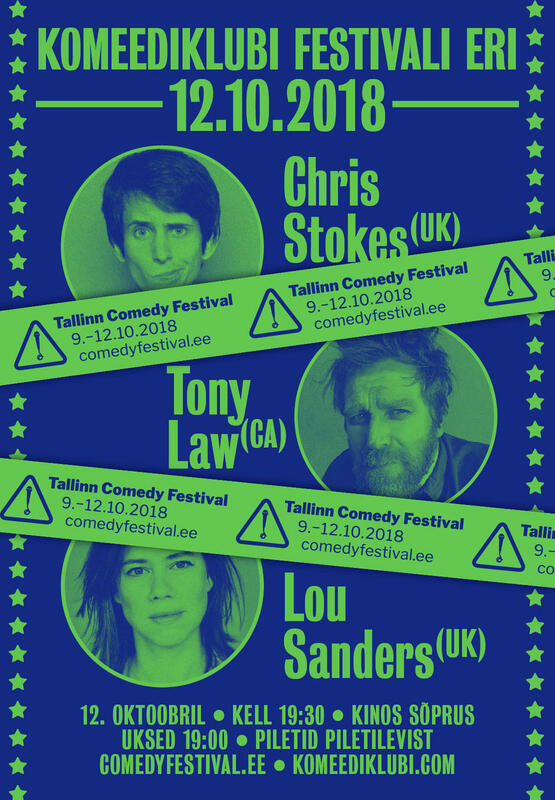 We’ve brought you an impressive list of mostly UK-based comics, including Paul Foot, Zoe Lyons, Nick Doody, Will Franken, Joel Dommett, Stuart Goldsmith, John Gordillo, Felicity Ward, Pete Johansson and many others. The Festival Special is, like the name suggests, special and it offers a good English-language slice from the festival line-up. Chris Stokes (UK) has been performing stand-up professionally since 2009. Chris, with a hilarious and erudite turn of phrase, has been described as playing on social misconceptions and dismantling them via gag-packed first-hand anecdotes told with a charming and offbeat sincerity. MCing is Lou Sanders, one of the most original comedians in Britain. An acclaimed stand-up, her fifth Edinburgh show alone garnered seven four- and five- star reviews. She has performed internationally including performances at the Melbourne Comedy Festival and the New Zealand Comedy Gala, and appeared in TV shows such as The Russell Howard Hour, Live from the BBC and Russell Brand’s stand-up hour on Comic Relief (BBC1).